Provides economical environmentally friendly temporary corrosion protection to metal substrates. VpCI-649 is a unique concentrated liquid formulation that protects ferrous and non-ferrous metals from corrosive solutions. In addition, this product is designed to provide long-term protection in fresh water and glycol closed loop systems. VpCI-649 is effective as a replacement for nitrite, bromate, and/or chromate-based formulations. 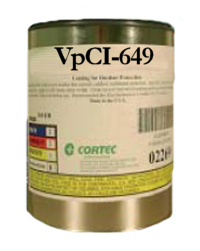 VpCI-649 combines contact and volatile corrosion inhibitors along with anti-scalants in non-toxic formulation that does not contain nitrites, phosphates, chromates, or heavy metals. This product helps solve the problem of disposal, particularly for large quantities of water. Effective for a broad range of applications to stop aggressive corrosion in systems containing fresh water, glycol coolants, etc. For seasonal wet lay-up application (up to 6 months) use VpCI-649 at a concentration of 0.5 wt.% of inhibitor by volume. For systems already using Molybdate, please use VpCI-649 OF which does not contain tracer. Available in 5 gallon pails (Cortec Product Code 13600485) or 55 gallon metal drums (Cortec Product Code 13600486). 5 gallon pail weighs 50 pounds and ships under our standard shipping rates. The 55 gallon drum must be shipped by truck. We will provide you with a freight quote before we ship this product. This product should be stored in tightly closed containers. Shelf life is 18 months.